It’s been almost three months since I purchased Bohm B76 noise canceling headphones. It’s been a quite incredible journey with this headset. It has not only amazed me in terms of sound quality, bass but also regarding build quality and battery life. Before getting my hands on it, I have purchased almost 10 to 15 cheap headphones on Amazon. They used to last less than a month or so and then I had to throw them. Most of the times the padding used to come out, and few times the earphone used to break from the joint. But then I thought, let’s give a try to a mid-budget headset and see how it goes off. And here I am. I haven’t faced any single problem using Bohm B76 till now, and I still have almost 4 and half year warranty left. Let’s face it; not everyone has a budget to purchase a high quality, studio-standard headphones especially when their pricing usually starts from $300. But if you are looking for a comparable headset which offers excellent comfortability, controls, and superior metallic build quality then you need to read this. Bohm B76 is quite superior to it older version not only in terms of features but also in design and build quality. It has an ultra-modern design with quite a sturdy build quality. And thanks to its brushed metal finish it looks absolutely stunning. Both the ear pads and the headband has a soft leather coating giving the overall design a more premium look. The padding on the headband is quite slim which on first sight it will make anyone think that it must be very uncomfortable. But once you put it on your head and adjust it properly, you won’t find any problem. Coming to the earpads, it feels really soft and outright luxurious. They cushion the ears really well. But even though the ears are well covered you can have long comfortable listening experience without ear sweating which is one great advantage. As for the colors, currently, it is available in silver accents and brown cold. Both the colors are suitable for the individual who is quite choosy regarding design and appearance. 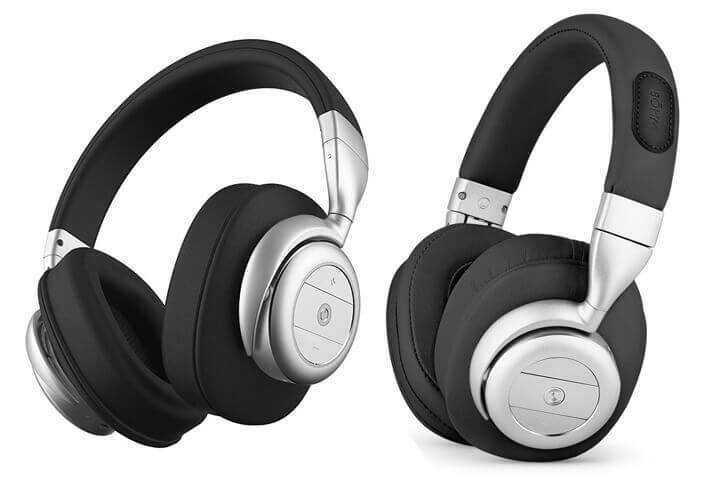 This wireless bluetooth headphone has a metallic body and a faux leather covering which justifies its price. The frame is built using aluminum and its the main reason behind its light weight. For people who like listening to music every time but are afraid of damaging their headphones must get Bohm B76. It has a lightweight metal body which not makes it more durable but also offers ultra comfortability. It has the potential to serve you for a long period of time. It has pads which are enclosed in faux leather and memory foam that segregate the ears from the ambient noise without sweating them. But if you are still worried then you can pay just extra $10.00 and can get four years extended protection plan from Asurion. It comes with one of the most superior active and passive noise canceling technology ever featured in a budget wireless headphones. For every music lovers who don’t want to be distracted by noise from their surroundings. It consists of a flip switch which helps to reduce the interruption that might emerge from the listener environment. With just a tap of a finger, you can easily control this device. It comes with one of the most advanced multi-function control buttons. With the help of this multifunctional button, you can control the power options, USB charging port, volume, a Bluetooth indicator and a noise canceling button and all this is at your finger’s tip for effective and efficient performance. Bohm B76 comprises of an aligned microphone that enables the user to make and receive calls perfectly with a hands-free control which is a great feature for music lovers. It has an easily accessible sound and plays controls. It has an ambient noise control button on the left side and a button its right side with which user can easily control the volume of the device. Users can also change the music track and play the next music or can answer the incoming calls. This headphone has 320mA battery which handles the music output and active noise cancellation with a remarkable performance. It is the only noise canceling wireless headphone I have come across which ensures 16 hours of playtime. I mean with just 2 hours of charging ( which is sufficient for this device to attain 100% power ) you can easily and comfortably use it for more than 16 hours. Actually, in my case, I was able to offer me almost 20 hours of music playback mainly because I love to listen to my favorite playlist in low volume. If you enable the inbuilt active and passive noise canceling feature which helps to reduce close to the 20-decibel noise level, then obviously the playback time will reduce, but you will still get around 8 hours of music playback. As far as connectivity is concerned, it comes with support for Bluetooth version 4.0 and uses Qualcomm CSR8635 single-chip Bluetooth audio ROM device. You can easily connect to the devices which placed in another room as it has an operating distance of 10+- meters. Coming to the battery, according to the company’s statement this over-ear headset comes with 302 mA battery. It is capable of attaining 100% power within 2hours or so. Once fully charged it can offer users with almost 16 hours of music playback. If its inbuilt advanced noise reduction feature is active which offers performance close to 20 dB, then users will get around 8 hours of disturbance-free, ultra clear playback. The weight of this headset is 635.029 grams, and its size is 6 x 3.9 x 7.4 inches. But you should note that it can be folded, and so it is quite portable. Excellent sound quality with good bass. It is durable and is lightweight considering other headphones with the metallic body in the market. Headband and ear cups are really comfortable mainly because of the high quality, thick padding. Clean metallic finish with smooth edges and corners. Ability to fold for easy transportation. Very easy to access multifunction control buttons. Does not have APT-X Technology. Some new users, especially who haven’t used any studio standard headsets may feel it heavy. Available only in two different colors. 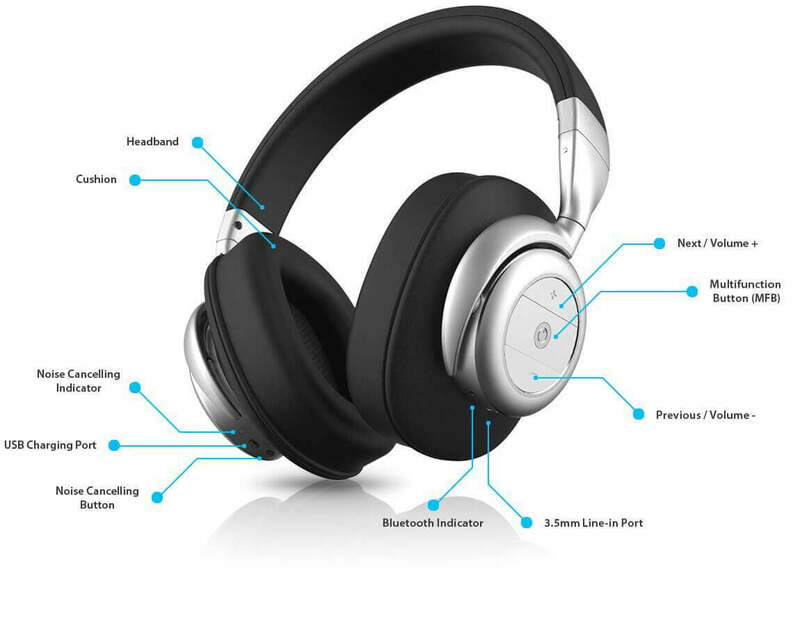 Overall for every music lover in the USA and around the world who want to listen to the voice of their favorite artist, the Bohm B76 bluetooth noise canceling headphones is a must buy. It has an excellent active noise cancellation feature. It offers good sound quality, provides extra padded foam ear-cups for the satisfactory listening experience. Furthermore, it is highly companionable with the majority of different wireless electronics and devices in the market. It's a lightweight wireless headphone which offers great comfortability, all thanks to its super soft ear cushions. It comes with easy to reach multi-function buttons. Using these buttons you can switch your songs, change your playlist and can control the volume of the headphone. I am personally using this awesome headphone and I really love it. I bought it a year back since then I never switched back to my Sony’s noise cancelling headphone. What I really like bout Bohm b76 is it’s battery life. Once fully charged you can enjoy atleast 12 hours of music without any problem. Bohm B76 is undoubtedly the best budget wireless headphone. I am a collage student and I really have to travel a lot. I travel almost 2 hours daily using public transport and that really squeezes 50% of my strength. But thanks to music, my playlist of super awesome pop songs and this super comfortable headphone, I can now enjoy my travel time. Hello, I’m am from Bangladesh. 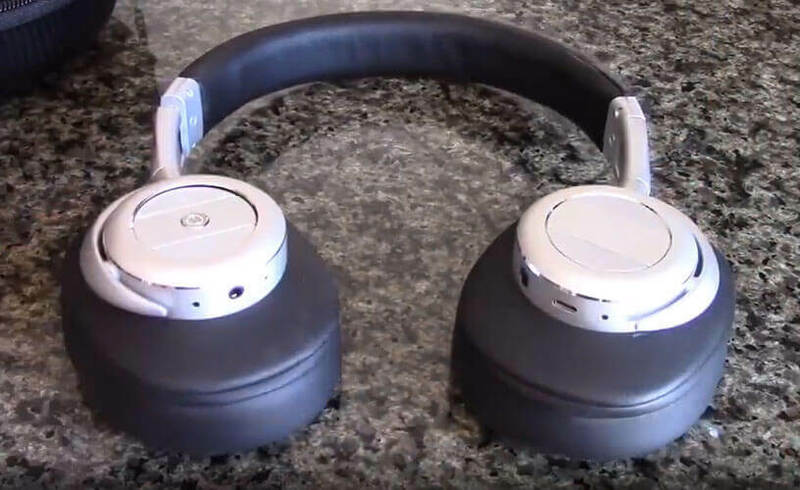 I am not an expert on headphones so before buying a wireless headphone, I searched websites for favorable reviews and after gone-through few reviews bought Bohm b76 a week before from Amazon. For purchasing a wireless headphone, my criteria were it should be comfortable, should have a nice look and long-lasting. like many of them have issues with longevity and build quality of the product. Now I am really scared and request any positive experience sharing from similar climate like Indian Subcontinent. Hi, first of all, thanks for your comment. I have Bohm B76 headsets and in the past 2 years, I have never experienced any issues with them.